Hand Carved from Genuine and Natural Green New Jade which has Marble looking texture. 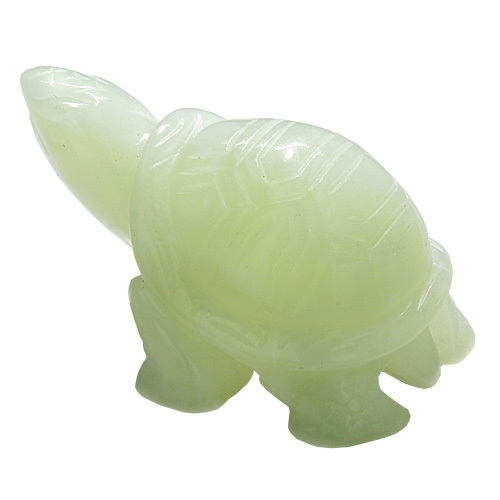 This is Very Special and Individual Lucky Totem Turtle Gemstone Carving made from Genuine and Natural Green New Jade Gemstone. This LUCKY Figurine is Good Luck Amulet and has powers of Evil Eye Protection. TURTLE is Symbol of Longevity and Heaven's Blessings. Turtles seem to possess an enviable and god-like resistance to aging and Represents Long Life. The Turtle is a Symbol of Good Fortune and is an positive omen bringing 10,000 years of happiness. The turtle carries the world on its back. This is a symbol of fertility, vitality, and great patience. The Chinese believed these animals foretold future events. The Turtle protects by teaching the family to protect themselves. She brings the blessings of heaven to the home. 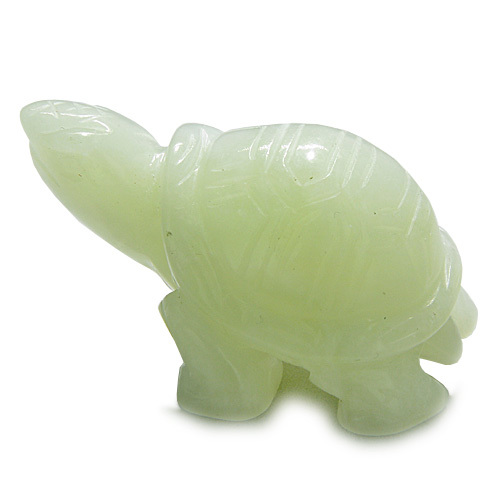 Turtle symbolizes both the stability of earth energy, and the magical mysteries of heaven. It is a Symbol of Good Luck, LOVE and Health. See Alternative View for More Details.